Tomatoes are that one fruit that you will always find in my fridge. Yes, it is a fruit! Who knew? Ever since I enjoyed a caprese salad; I love the pairing of tomatoes with balsamic. Sweet and tang is a great duo. 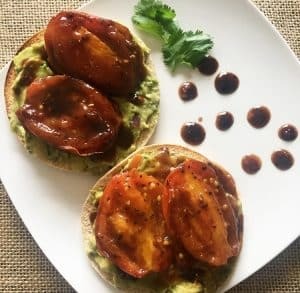 Fresh tomatoes on their own are beautiful and delicious to eat but I decided to experiment the idea of sauteing the tomatoes and smothering them with balsamic….Result? A caramelized roasted color and deep flavor. This is super easy to make and will definitely elevate your palette for tomatoes! Take out a medium sized pan and turn the flame on medium heat. Drizzle about 1 tablespoon of olive oil into the pan; let it simmer for a minute. Make sure pan is hot; you want to hear that sizzle when the tomato hits the pan. Gently place the tomato halves face down into the pan; you should hear a loud sizzle if not, the pan isn’t hot enough. Be careful from any oil splatter. Leave tomatoes like this for 5 minutes in the pan. Flip over a tomato half to check for nice dark marks-a caramelized look. 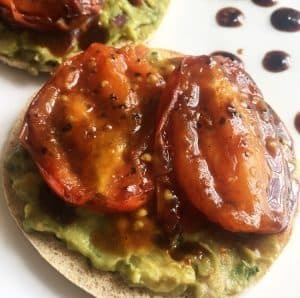 Once that is achieved, flip over all the other tomatoes and add the balsamic vinaigrette-just enough to coat the entire pan. Let that simmer for another 5 minutes; until you notice the skin peeling off the tomato. 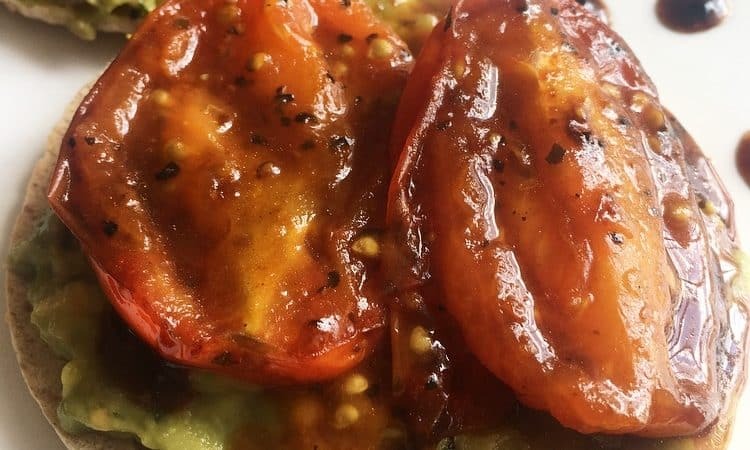 Using a spoon; coat the tomatoes with the balsamic glaze from the pan itself. I say glaze because the consistency of the vinaigrette when simmered will become thicker. It is then ready to serve as a healthy delicious side or on top of some toast. I paired it with leftover guacamole on a thin piece of multi grain bread-A perfect healthy lunch. Enjoy! Previous Post Homemade Guacamole – Fresh, Easy, and Super Yummy! Next Post Chicken Veggie Curry Stew – A comforting nutritious one pot dish!